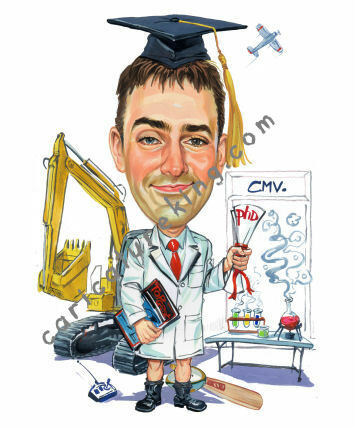 Here is a fun Graduation Gift Caricature. What better way to celebrate graduating after years of hard study that with a highly memorable piece of custom art! It’s a gift for his graduation ceremony (completed PhD in Biomedical Science). I would like to make it funny. (CMV) Likes cricket, Top Gear, Sydney Swans and Bulldogs. Caricature artist Harry took these notes and created this unique graduation gift incorporating many of the interests – some subtle like the cricket bat, and the AFL ball. I think you will agree, as did the customer, it turned out great!